If you find any bugs with this plugin please contact us and include a clear description of the problem so we can fix it. However, take note that we do not support modifications such as changing the appearance or functionality of the plugin. Congratulations on purchasing this complete solution plugin for adding coupons to your WordPress website. We hope that you will use this plugin to promote your company’s products and services, increase sales, and make your customers happy. Installing a WordPress plugin is easy to do and only takes one step - uploading the plugin. A plugin can be uploaded either using the WordPress dashboard or via FTP. Navigate to Plugins> Add New. Click on Browse, select the Coupine.zip file from within the extracted folder, and click on the Install Now button. Check the WordPress dashboard for the menu item labeled Coupine. Upload the plugin file to /wp-content/plugins/directory. To configure the settings of your Coupine plugin navigate to Coupine>Settings on your WordPress dashboard. Here you will see three tabs for configuring your plugin: General, Customize, and License. This tab is for configuring general settings that will apply to your entire coupon section. Coupons Per Page: Determine the number of coupons you would like to display per page. Show Related Coupons: Show or hide related coupons. Related coupons are helpful to readers looking for similar products or services also being discounted. Related Coupons Per Page: Determine the number of related coupons you would like to display per page. Coupon Slug: Choose a short post or page description that can help create a user friendly and URL valid name to be used in the permalink. 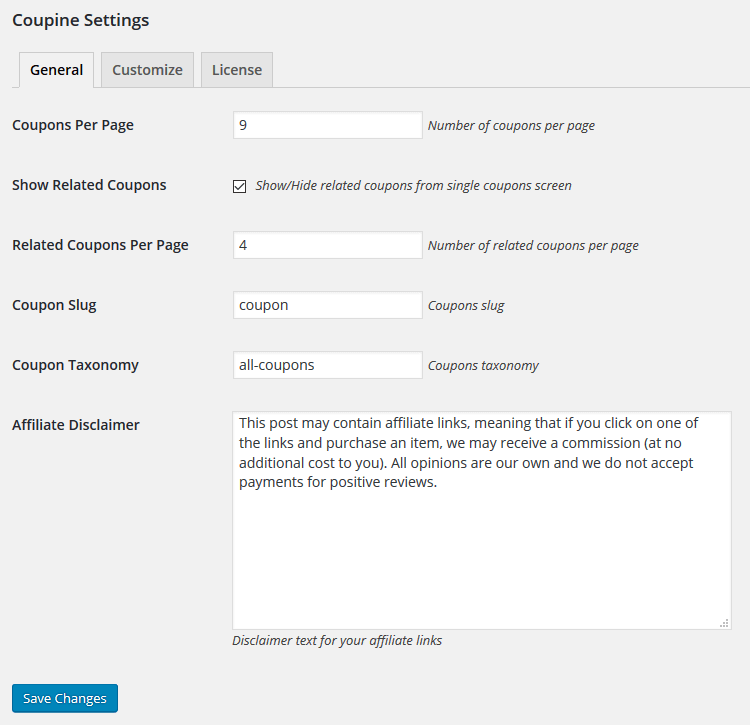 Coupon Taxonomy: Group together your coupons with the taxonomy option. This will help your readers find coupon deals as they explore your website. Affiliate Disclaimer:Enter your disclaimer text for any affiliate links associated with your coupon products. Save all of your general settings by clicking on Save Changes. This tab is for entering you plugin’s License Key. In order for your plugin to become active you must enter a valid License Key and select Save Changes. This tab will take you to the Live Customizer for your active theme when you select Customize Coupons. From there you are instructed to navigate to Coupon Options for making changes to your coupon section. 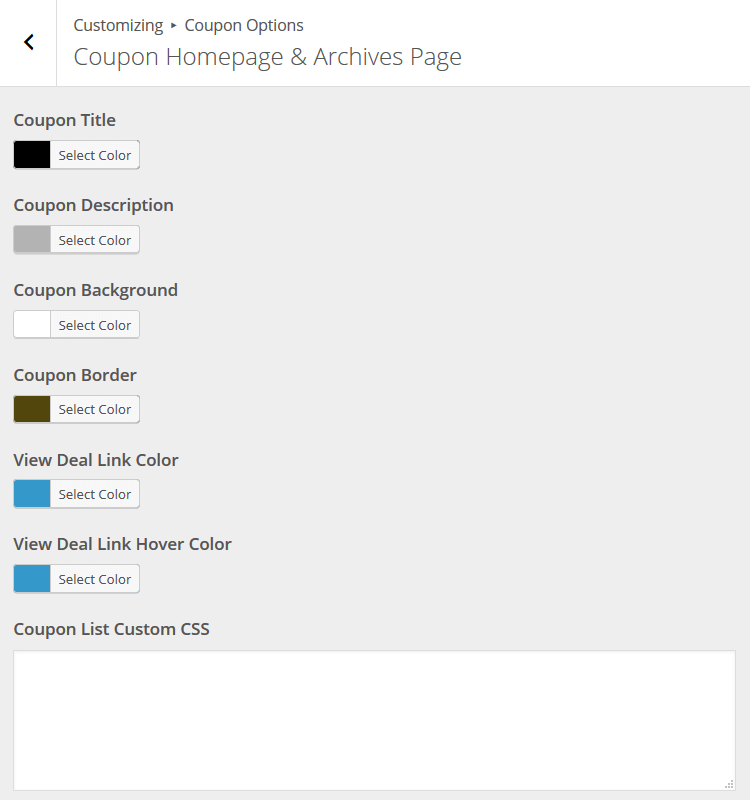 To customize your coupon section use the Live Theme Customizer and select the menu item Coupon Options. You can access the Live Theme Customizer by selecting Appearance >Themes in your WordPress dashboardor by selecting Customize Coupons found under Coupine >Settings >Customize, also found in your WordPress dashboard. To customize your coupon homepage select Coupon Options >Coupon Homepage & Archives Page. 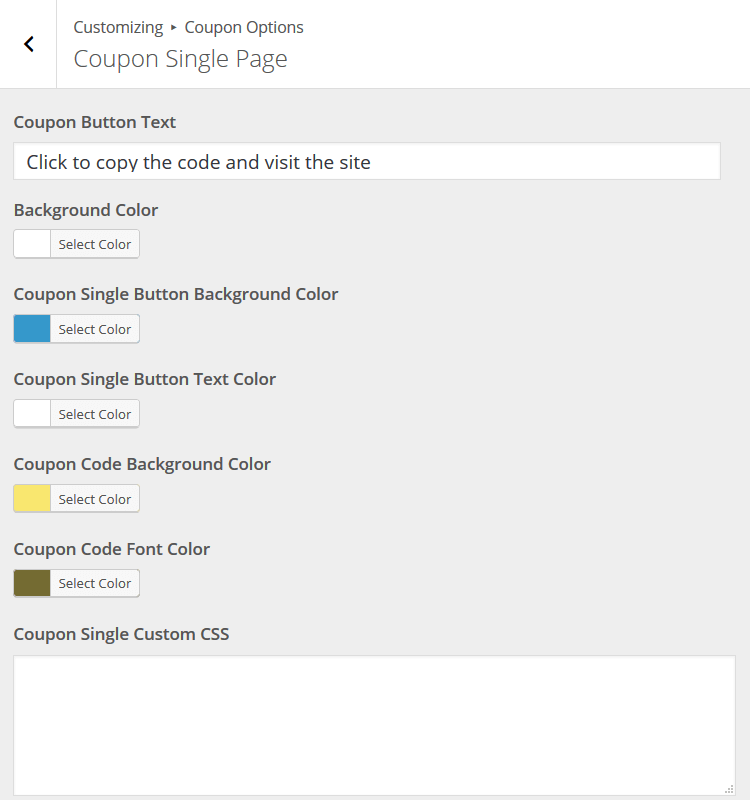 To customize a single coupon page select Coupon Options >Coupon Single Page. To create a new coupon to add to your website’s coupon section navigate to Coupine >Add New from your WordPress dashboard. You will be directed to a WordPress editor screen much like you would see when creating a new post or page for your website. 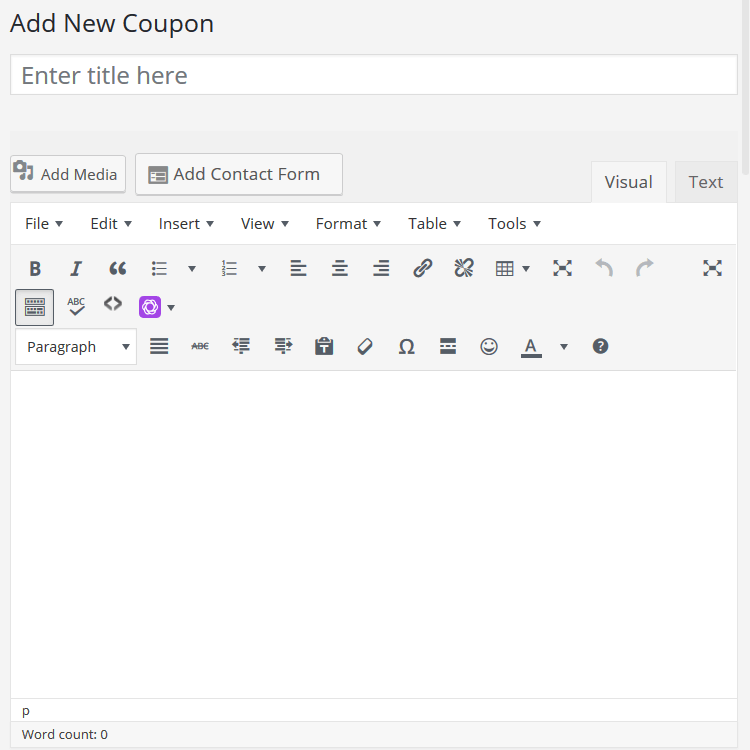 You can title your coupon so that your readers will know instantly what product or service the coupon can be used for. Enter text, just like you would for a post or page, describing your product or service, what the coupon deal is, and how your customers can go about using the coupon. Change fonts, use headers and subtitles, add images, add affiliate links that readers can click on, and more. Assign categories to each coupon you create so that your products and services can be easily found by your readers while exploring your website for special deals. 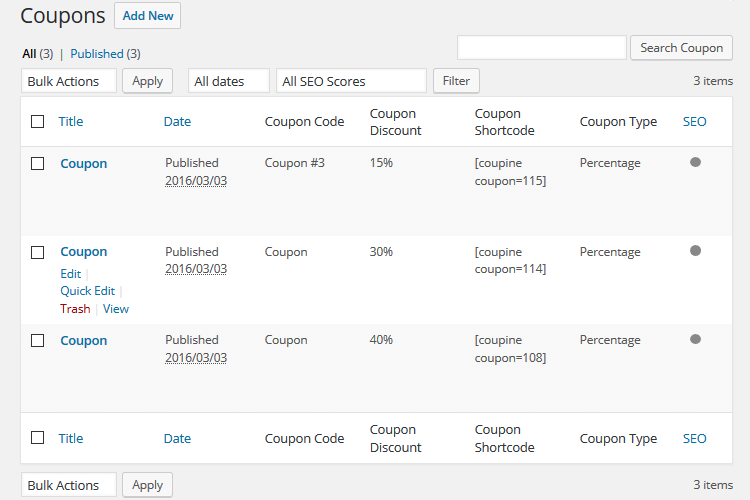 You can also access Coupon Categories by navigating to Coupine >Coupon Categories in your WordPress dashboard. 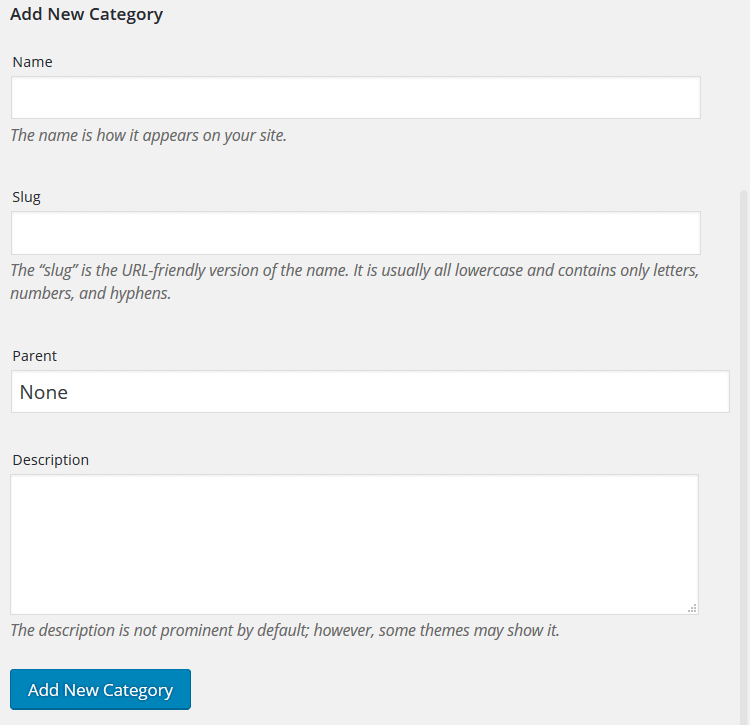 Here you can add new categories, include a URL-friendly slug version of your category’s name, designate a parent category is appropriate, and add a description. Do not forget to select Add New Category so that your changes will be saved. Note: The description will not always display on your website, though some themes will support it and display it for your readers. Coupine allows you to search for categories using the search bar located near the top right hand corner of the Coupon Categories screen. You will notice on the same screen that allows you to create new categories that any categories previously created will show with their Name, Description, SEO, Slug, and Count. Note: To change the SEO of each category you create simply hover under the established category’s Name and click on Edit. You will then be directed to a WordPress editor screen much like you would see when creating a new post or page for your website. Here you can use Yoast SEO to optimize your categories just as you would any post or page content. Set a featured image for each coupon you create adding visual appeal to your readers upon first glance of your special deals. This helps inform your readers right away what your coupon is for before reading a single line of text. Coupon Code: This will be the code customers will input during the checkout process in order to take advantage of the coupon deal you are providing them. Coupon Discount Value: Enter the percentage off or currency amount to be discounted for your coupon deal. Coupon Type: Designate whether the coupon deal is a specific percentage off of the going price or an amount off the top of the going price. Redirect URL: Designate a redirect URL so you get credit for the purchases your readers make. Coupine is compatible with Yoast SEO making optimization of your coupons possible. Just as you would any post or page on your website, Yoast SEO allows you to choose a Focus Keyword and add a Snippet Preview for those searching the Internet to see in search results. You will be given an SEO score (green, yellow, or red) depending on the strength of your optimization with suggestions for making it stronger. From this screen you can also access any coupon you have previously created and Edit, Quick Edit, Trash, or View it. There is also a Search Bar for easy access to previously created coupons. 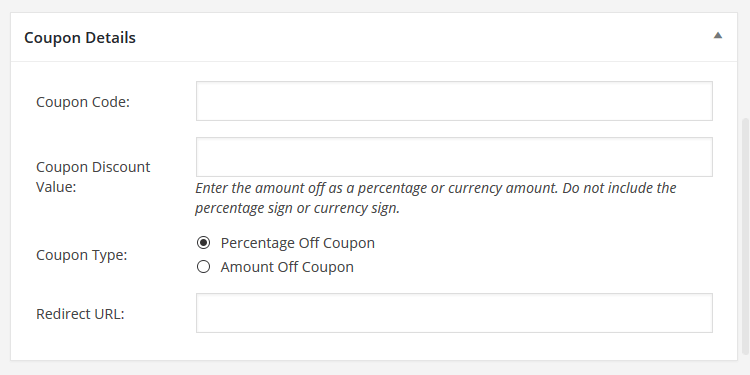 This is especially useful if you have several coupons created and need to find a specific one, or if you use recurring coupons often and need to access a specific recurring coupon to add to your coupon section. Once again, thank you so much for purchasing this plugin. As I said at the beginning, I'd be glad to help you if you have any questions relating to this plugins. No guarantees, but I'll do my best to assist.